To accompany the clip I posted earlier of the new documentary, Valentino: The Last Emperor, you really must read Cathy Horyn’s candid discussion with director Matt Tyrnauer over on her blog at the New York Times. It is a fascinating glimpse into a massive creative process that unfolded over two years while the movie was filmed. Cathy Horyn: During these TV interviews, have people seen the real Valentino? He’s very protective of his image. How did you get past that? Matt Tyrnauer: That’s the thing, nobody ever sees the real Valentino. I told him before we started, “You’ve got to let loose a little bit and take a chance. Otherwise, you’ll seem over-privileged and unsympathetic and not human.” He didn’t want to hear it. He would listen to me for one second. I gave him the same talk, director to star, for a couple of years. 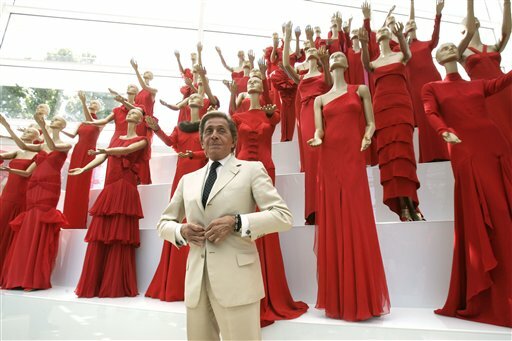 You know, when Valentino and Giammetti first saw the movie they freaked out. They weren’t prepared. I had a contract that gave me final cut—a very hard-won contract. I wouldn’t have made the movie without it. I think it’s a warts-and-all portrait, but you see the warm soul of Valentino. Doesn’t that just make you need to see this film?